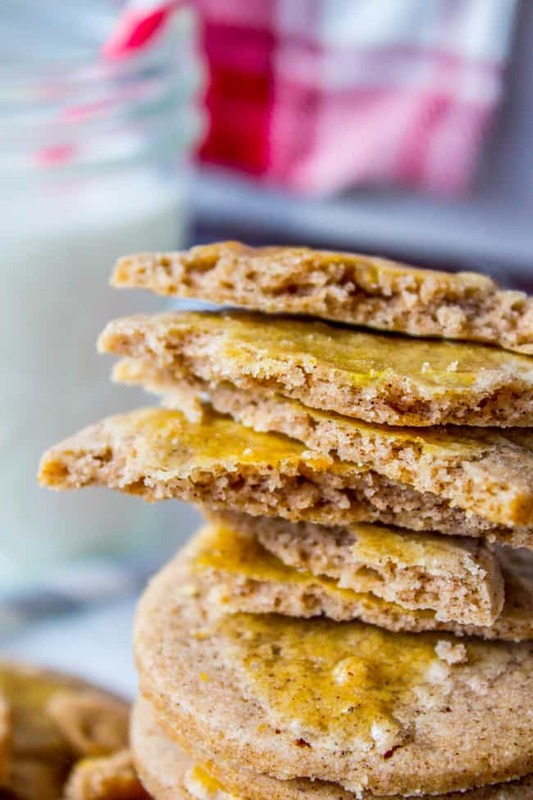 Swedish Cardamom cookies that are ultra buttery and crispy-crunchy, yet still light and airy. There is cinnamon in the recipe but cardamom is the star flavor. These are a family classic that we make every year. 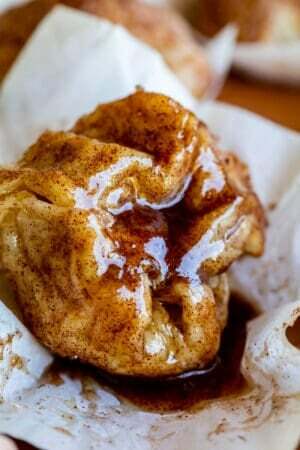 Perfect with milk, hot chocolate, or coffee! I have a confession guys. I’ve been listening to Christmas music since like August. I know, I’m a freak. It’s such a relief to finally come clean about my holly jolly addiction. But now that it’s December none of you can judge me. Christmas music puts me in a good mood any time of year, but it’s even better with tree decorating, hot chocolate, and a cozy fire, which is what’s been going on around here nonstop lately. Oh and don’t even get me started on the cookies. SO MANY COOKIES. But before we get to the cookies I have to tell you about this awesome advent calendar my sister made. Have you guys heard of #LightTheWorld yet? I’m LDS, and this Christmas our church is doing 25 ways over 25 days to follow the Savior. Every day until Christmas you’re supposed to do some of the things Christ did, like show compassion, help others see, show love for your mother, honor the sabbath, etc. There are ideas of things you can do that are on theme for each day. My sister Laura decided to make her own calendar for her kids, with the same themes each day, but with simple stuff they can do. Here is the kid calendar she made:christmas-advent-calendar-behaviors-of-christ, and here is the regular one that you can do if you like. It’s an awesome way to remember the Savior this season. Our kids are super excited about it. Stuff like this is what makes Christmas so awesome! And also cookies make Christmas awesome. This is yet another recipe from Eric’s famous great-grandmother Prudy, who was Swedish. She is an absolute legend, especially in the kitchen. Her granddaughter (Eric’s mom) made a family cookbook with all of Prudy’s Christmas cookies. I’m slowly trying to document them all here on the blog; see below the recipe for links to other Swedish cookies from Prudy. 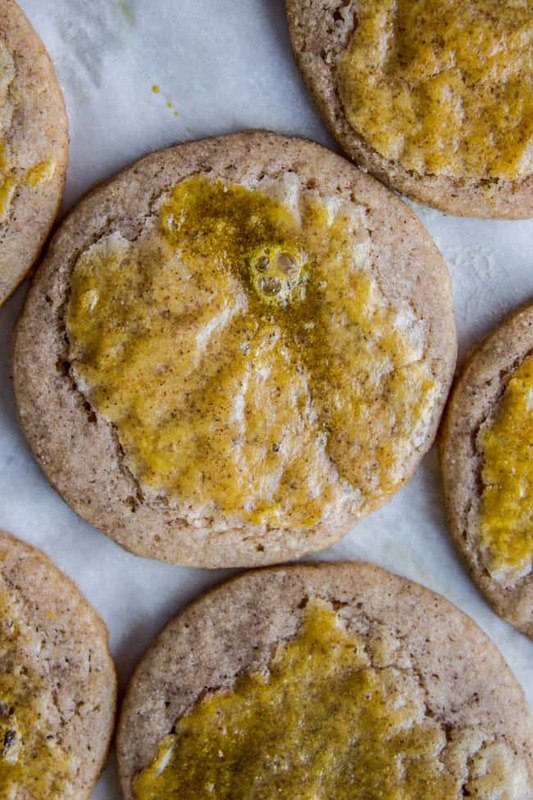 Cardamom is definitely the star in these cookies. Cardamom is such a strong spice that most recipes call for just a little smidge, but not these cookies. Go big or go home. In fact, I would say that if you don’t like cardamom don’t bother making these cookies. In Eric’s family they are simply called “Cardamoms.” They are not overly sweet; there’s only a half cup sugar in the whole recipe. It’s almost like cinnamon-cardamom flavored pie crust. Which means I can throw down a dozen of these in one sitting, no problem. I used to be a crispy-cookie-hater, but I think I’ve officially pulled a 180. 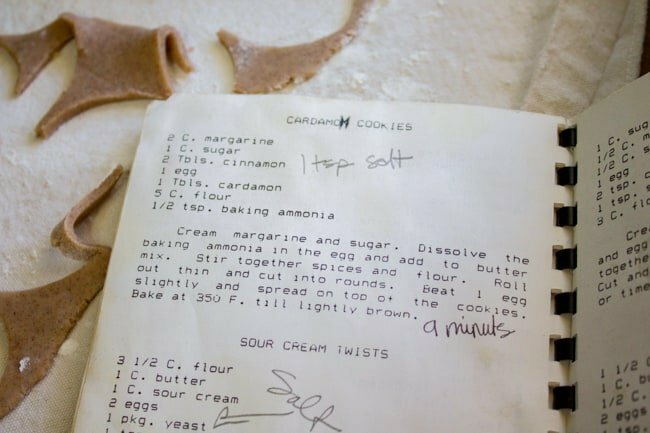 There is a special ingredient needed for these cookies: baking ammonia. Never heard of it? Neither had I, before marrying into the family. And I don’t have any other recipes that call for it, but I still buy it just to make Cardamoms; it’s totally worth it. I asked Eric’s mom if there was any substitute and she said no, they won’t get as light and crispy without it. 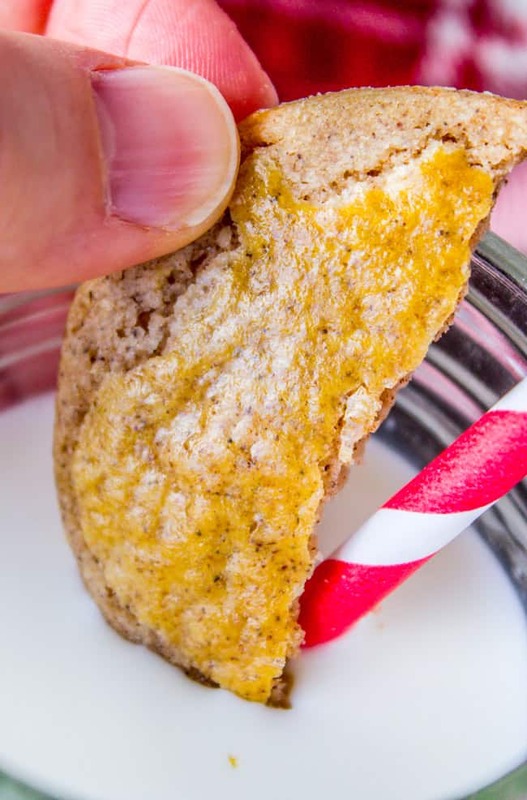 I looked it up and read on King Arthur Flour that sometimes people substitute an increased amount of baking powder; but the cookies won’t have that “ultra-tender, extra-crunchy” texture that is what Cardamoms are all about. 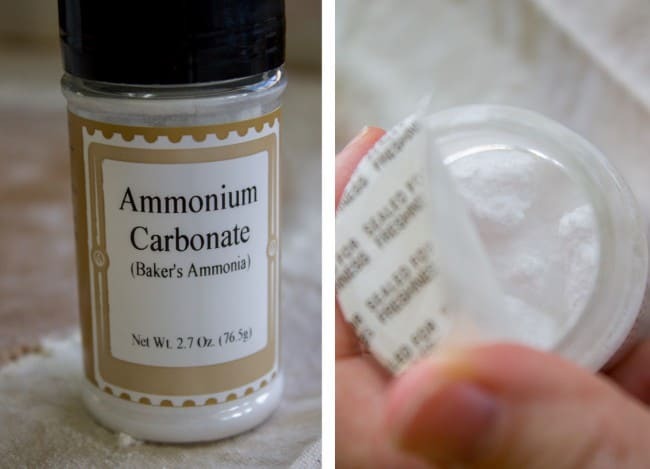 Make sure you keep the lid on really tight; baking ammonia will evaporate if exposed to air. The yellow stuff on top is an egg. This is the perfect cookie to eat with hot chocolate, or coffee, though I’ve never tried that (LDS, remember?). Kris told me that’s how her parents and her grandma always used to eat these crispy Swedish cookies: after dinner with a mug of coffee. This makes a big batch of cookies (Prudy’s original recipe made 100! I halved it because I’m not crazy). 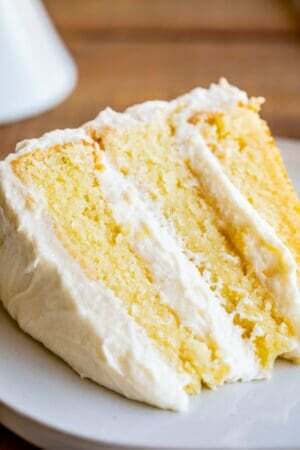 In a large bowl or stand mixer, beat the butter and sugar together for 2-3 minutes, until light and fluffy. Make sure you scrape the sides and bottom of the bowl. In a small bowl, beat 1 egg. Add the baking ammonia and stir to dissolve. Add the mixture to the butter and beat. Add the flour to the bowl but don't mix it in. Use a small spoon to stir the salt, cinnamon, and cardamom into the flour. Beat the flour into the dough. Don't over mix. Chill the dough for 2-3 hours (or you can leave it in the fridge for 2-3 days). When you are ready to bake the cookies, let the dough sit on the counter for a few minutes until it is workable. Preheat the oven to 350 degrees F. Line 2-3 baking sheets with parchment paper or silpats . Split the dough in half. Sprinkle flour onto a work surface. Use your hands to flatten the dough, then use a rolling pin to roll the dough out very thin, about 1/8 inch. Use a 3-inch biscuit cutter to shape the cookies. 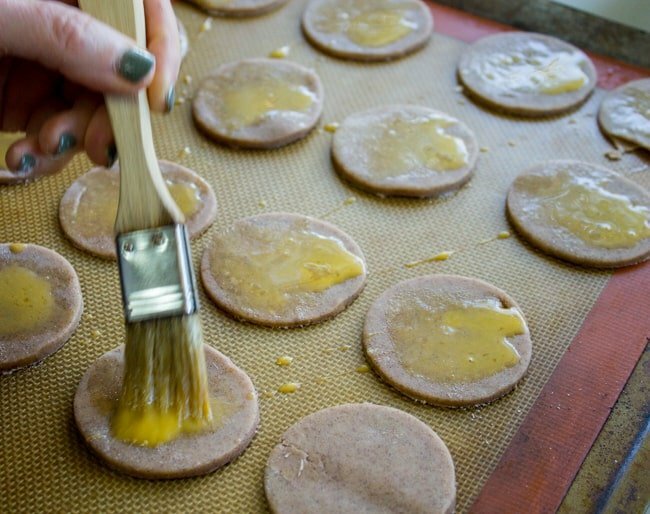 Use a spatula to transfer the rounds to the prepared baking sheets. They do not rise much at all, so you can fit them pretty close together. Keep re-rolling the scraps until it's gone. Repeat with the other half of the dough. In a small bowl, lightly beat 1 egg. 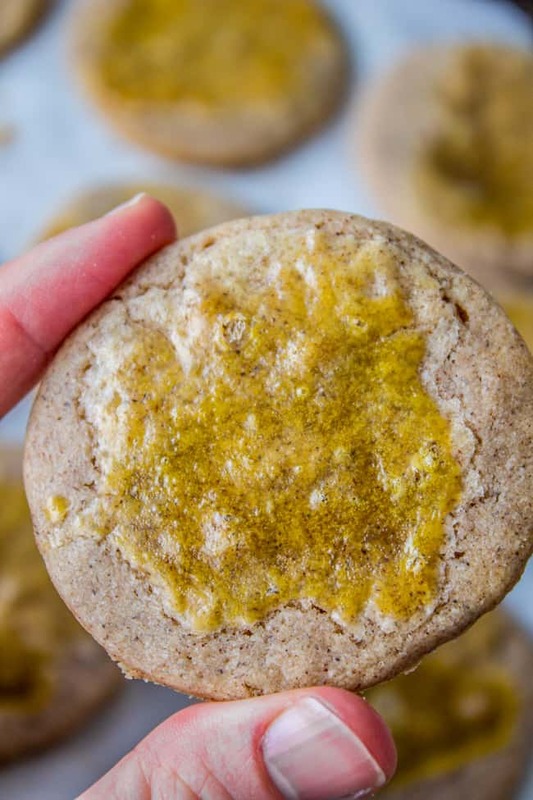 Use a pastry brush to brush the top of each cookie. Don't be shy; use a lot. See photos. Bake the cookies at 350 for 8-10 minutes. They should be lightly browned on the edges. You can see in the photo above that the original recipe was twice this amount, which would make about 100 cookies. Perfect for Christmas cookie plates! 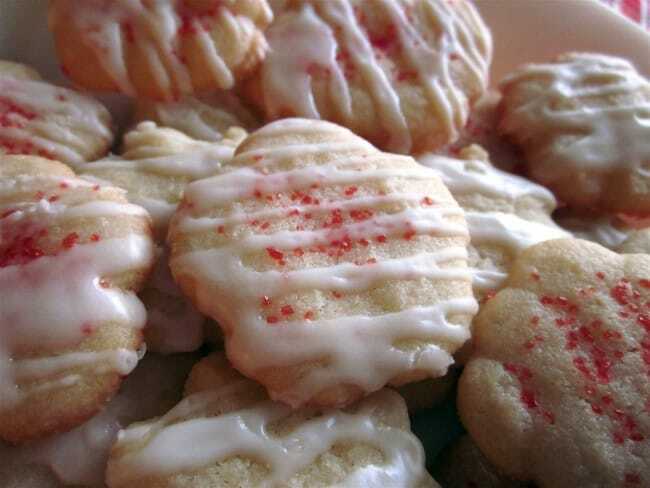 Swedish Spritz Cookies << we just made a huge double batch of these today, like we do every December. The kids had so much fun using the cookie press! 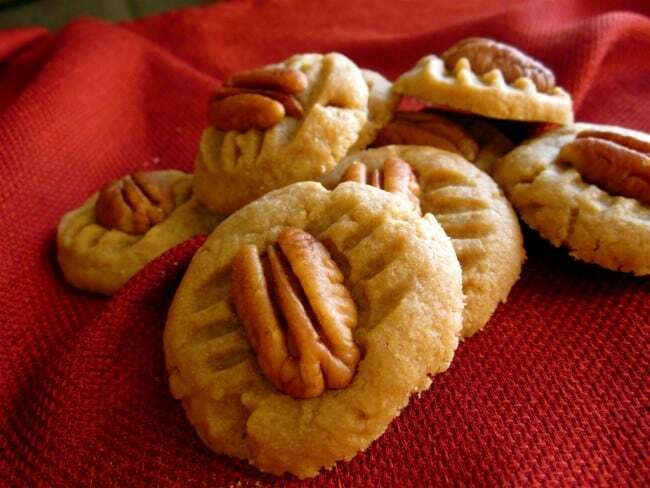 Butter Pecans << we made these ones last week before Thanksgiving even. This is ALWAYS the first Christmas cookie made at our house. 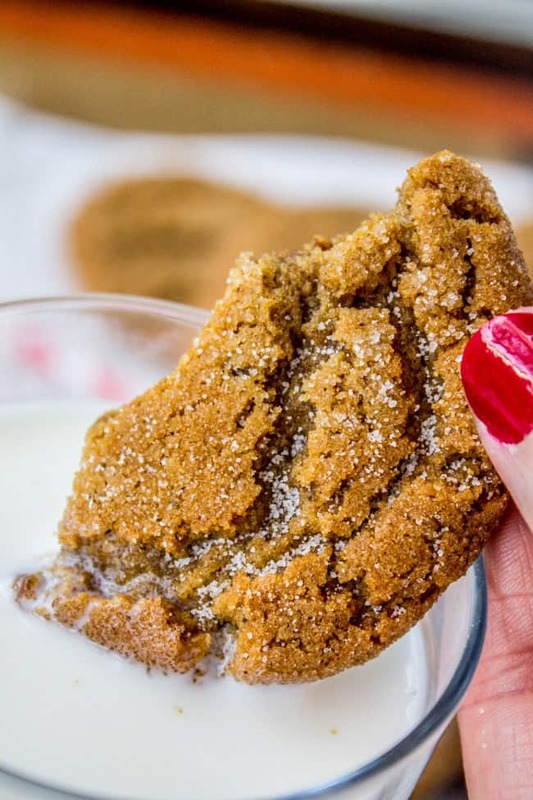 Gramma Prudy’s Classic Gingersnaps << I can literally eat my weight in these gingersnaps. Other Swedish cookies you will love! There are a couple affiliate links above. This means you pay nothing extra and I make a small commission. Thanks for supporting The Food Charlatan! Hi Mirjana! You can just omit it from the recipe. The cookies will not be as crisp but they will still be tasty! My grandparents were Swedes born in Finland. Grandma and my mother frequently made Swedish Sweet Rolls with cardamom. I’m anxious to try this recipe. Got some ammonium carbonate and made cookies. They are definitely not crisp. They are tasty, but not what i expected from the description. I even baked them slightly longer as they weren’t looking brown. Anything else you think of that would make them crispier? That is so strange Burna! We’ve been making these for years and years. Did you roll them out pretty thin? I’m sorry they weren’t what you expected! 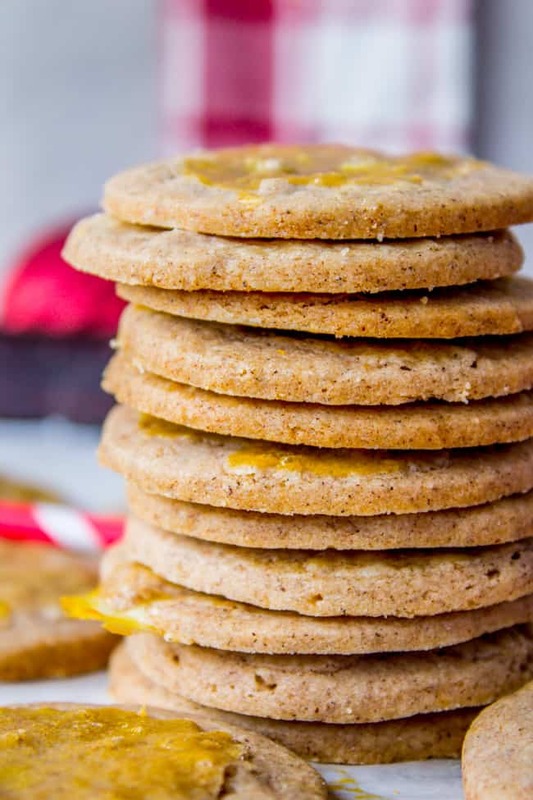 I LOVE cardamom, and trying new recipes that come from around the world, so made these to along with my usual Christmas cookies. They’re wonderful! Adored the light, crisp texture you get from the baking ammonia, and I think I’d even up the cardamom a bit next time (and there will definitely be a next time!) 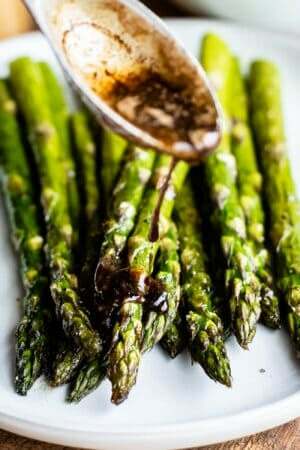 Thanks to you and Great Grandma Prudy for sharing this great recipe! Yay!! I’m so glad you enjoyed them Moni! I’ve been looking for some other recipes to try out with baking ammonia because I’m officially in love with it. Hopefully I will blog some of them soon! Merry Christmas to you! A different twist in cookies. Mommies must try it,your kids gonna love it! So glad you finally blogged these Karen! Eventually my Prudy cookbook will totally disintegrate but the recipes will all be in cyberspace! Me too, now I won’t have to bug you for picture every time I want to make it! Thanks for all your help with these posts Kris! Cardamom is so under-utilized. It’s one of my all time favorite spices! And I say we start a movement for Christmas music all year round, whaddya say? Love the Advent Calendar. I posted it to my facebook. Thank you for sharing. I’m so glad you like it Melissa! It’s nice to have concrete ideas for how to serve every day. Thanks for sharing! Poor cardamom, it doesn’t get nearly enough praise. And these sound textureallyh out-of-this world. WANT. So true right? It’s like a forgotten spice in America. I had never even heard of it til I was an adult, crazy right? Hi Mike! 1 cup of butter is 8 ounces, according to google. Happy baking and Merry Christmas!